What gardener wouldn't want to get a more accurate forecast of the weather, to be able to predict well in advance if they were going to get rain or should plan on watering? After all, no gardener wants to pay for water to thoroughly soak the garden one day and then wake up the next morning to a steady downpour of free rain. In our quest to accurately determine what the weather will be like as far in advance as possible, we use a variety of methods and sources, but then the weather happens and it is appears that everyone was just guessing. Wow, just in time because it looks like Carol was about to reveal some weather predicting secrets that really shouldn't be revealed because, dear gardeners, we are garden fairies and we know you can't handle these secrets! You'll tell everyone like Carol was about to do. But we are nice garden fairies, so we'll go ahead and tell you one very accurate secret way to predict the weather so you will be one hundred percent right every time. Go get your pencil and some paper to write this down because we are garden fairies and we don't trust this Internet to always be here and we don't want you to forget this valuable secret. What you need to do is set up one of those fancy solar powered fountains like Carol's frog fountain and then listen and watch! 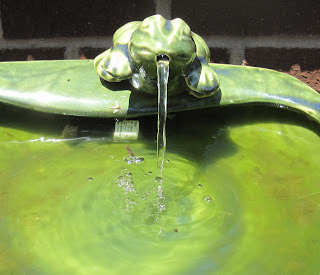 If you hear water gurgling out of the froggy's mouth and see it splashing into the basin, it's a sunny day! If you don't hear the water gurgling out of the froggy's mouth and don't see it splashing into the basin, it's a cloudy day. If the basin is filling up and there is no water coming out of the froggy's mouth, then it is raining! You can also tell time with this fountain. We garden fairies think this is an added bonus, as we like multiple use tools! If you can see the fountain, it is day time. If you can't see it, it is night time. We are garden fairies. We think that is all you need to know about time. Hours and minutes are irrelevant to us. And that is all we garden fairies think you need to know about predicting the weather and telling time. We are garden fairies, after all. That is too funny! My dad had a weather rock like that once. It had instructions on it about rain (it's wet), night (can't see it) snow (covered up). I don't remember what else. I think the fountain is even higher tech though! I'm sorry, Thorn, but Carol's fountain only tells what the time and weather are at the moment. By definition, a prediction tells what's going to happen in the future. I do like the fountain though.